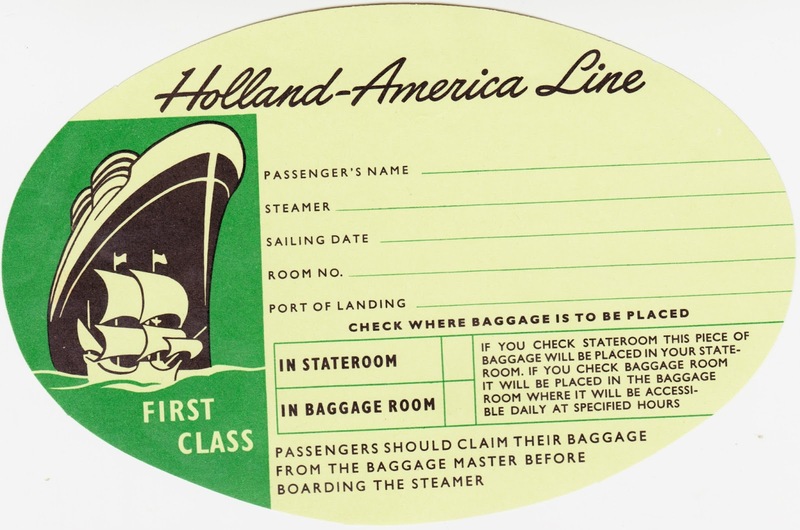 This is an unused Holland-America Line baggage sticker that my great-grandmother placed in one of her scrapbooks. It's green, oval-shaped and measures 6.5 inches across, at its widest point. It includes spaces for the passenger's name, steamer, sailing date, room number and port of landing. Passengers could choose whether this piece of luggage was to be placed in their stateroom or in the baggage room, where access to it would be limited. Here's a link to a rectangular version of essentially the same luggage label on Jumpingfrog.com. Holland America Line was a Dutch-owned shipping company from 1873 to 1989. It helped to bring many immigrants from the Netherlands to North America over the years, especially during the final two decades of the 19th century. Its transatlantic passenger service ended in the early 1970s, but it got new life in 1989 when the company was purchased by Carnival. Transatlantic cruises returned in 2011. Holland America's newest passenger ship, the MS Koningsdam, is the fleet's largest ever and made its maiden voyage in April 2016. 1940s comic postcard and "girls out for a whirl"